September 10th is International Suicide Prevention Day, a strong reminder that it is OK to Talk and ask for help! 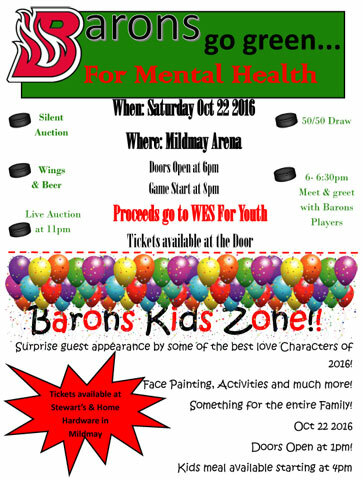 On September 22nd, the Hanover Barons junior hockey team, Buddsteel Architectural Products Ltd and other concerned local businesses will team up in support of Wes For Youth for a benefit game at the Mildmay Arena. Kids zone opens at 1 pm, with face painting, special visits by loved characters and lots of other fun activities. At 4pm there will be a special kids meal! Doors open at 6pm for a meet and greet with the Hanover Baron players, wings & beer and silent auction. Game time is 8pm with a 50-50 draw and live auction after the game at 11pm. Tickets are available at Stewart’s and Home Hardware in Mildmay and at the door. For more information on Wes for Youth please click below! And remember it is OK to talk and ask for help!